We’d love your help. Let us know what’s wrong with this preview of Meridian's Shadow by Dan Moore. 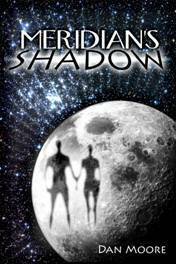 To ask other readers questions about Meridian's Shadow, please sign up. I was sold on this book when I read the synopsis. I had no idea how much better the story would be than the synopsis could portray. I love complex epic tales where “the little guy” has his life thrown into chaos by some mega-sized entity, where there are many characters that all play a role and have such distinct personalities that you have no trouble remembering who is whom. The last epic of this caliber that I read was “The Gap Series” by Stephen R. Donaldson. 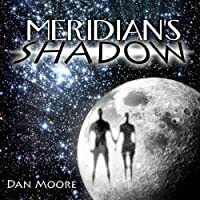 “Meridian’s Shadow” is that kind I was sold on this book when I read the synopsis. I had no idea how much better the story would be than the synopsis could portray. I love complex epic tales where “the little guy” has his life thrown into chaos by some mega-sized entity, where there are many characters that all play a role and have such distinct personalities that you have no trouble remembering who is whom. The last epic of this caliber that I read was “The Gap Series” by Stephen R. Donaldson. “Meridian’s Shadow” is that kind of epic tale. This book had me hooked from the very beginning. I suppose it's mainly a science fiction, but I also think it belongs in the "epic adventure" category. Dan Moore is a very descriptive, character-oriented author. Each character is multi-faceted, even the bad guys. I love how the bad guys have a background too, so the reader can see why they are the way they are. I love how this story had several parts to it. Right when you think everyone is safe and everything's going to be just fine, something ha This book had me hooked from the very beginning. I suppose it's mainly a science fiction, but I also think it belongs in the "epic adventure" category. Dan Moore is a very descriptive, character-oriented author. Each character is multi-faceted, even the bad guys. I love how the bad guys have a background too, so the reader can see why they are the way they are. I love how this story had several parts to it. Right when you think everyone is safe and everything's going to be just fine, something happens, and suddenly a new adventure has begun. And there were no slow parts at all. This writer has the amazing skill of describing things in great detail, without boring the reader. I saw this whole story play out in my mind. I loved how dismal the asteroids seemed. And I agree with another reviewer -- it was cool how big space seemed in this book. There definitely were no Warp-5 ships in this tale.